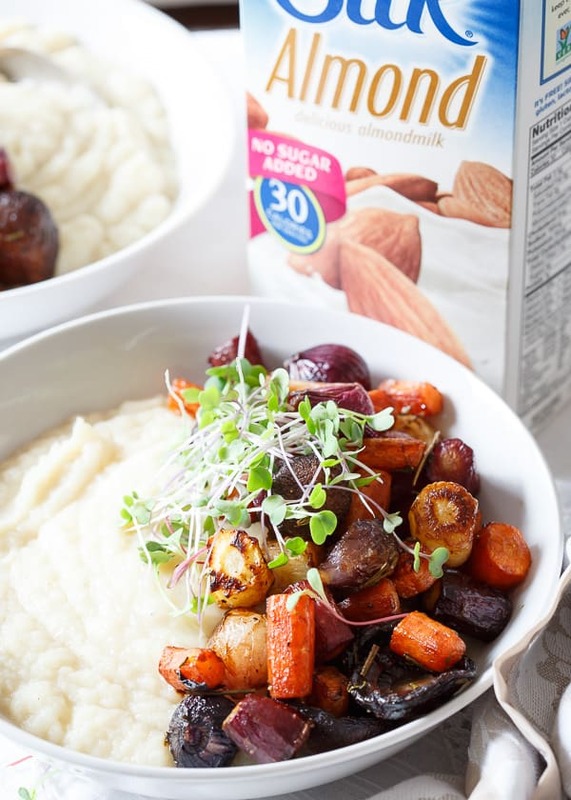 Creamy celery root puree makes the perfect base for this vegetarian meal of sweet balsamic roasted rainbow carrots, pearl onions and mushrooms. March feels like this in between balancing act with spring hopefulness, longer, warmer sunny days and the anticipation of lighter meals filled with things like strawberries and asparagus on one hand with the it’s still winter, let’s cozy up with a comforting meal, sweatpants and a fleece blanket on the couch and watch Netflix mentality on the other. At least, that’s what it feels like for me. This meal lives perfectly in the balance of the two. 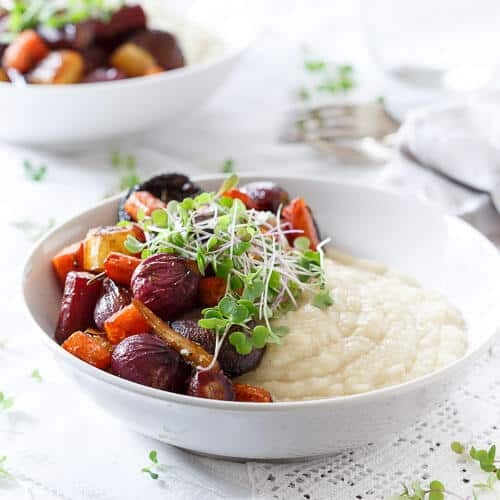 Celery root puree with simple balsamic roasted vegetables is comforting and hearty enough to still legitimately fall into the “winter food” category but light enough that it doesn’t weigh you down as you prepare for spring. The balsamic vegetables are sweetly roasted until that perfect caramelization occurs and balanced with just a slightly tangy vinegar pop. The celery root puree is comforting and creamy like a mashed potato but lighter and healthier thanks to vegetable broth and Silk unsweetened almondmilk (I love using their unsweetened varieties for all my cooking/baking so I can control the sugar). Guarantee you won’t believe there’s no butter or fat in it. Don’t they look just like mashed potatoes?! And the pop of micro greens on top will remind you that spring really is just days away. There are few meatless meals I feel truly satisfied after eating, but this (along with my winter vegetable curry) is definitely one of them. 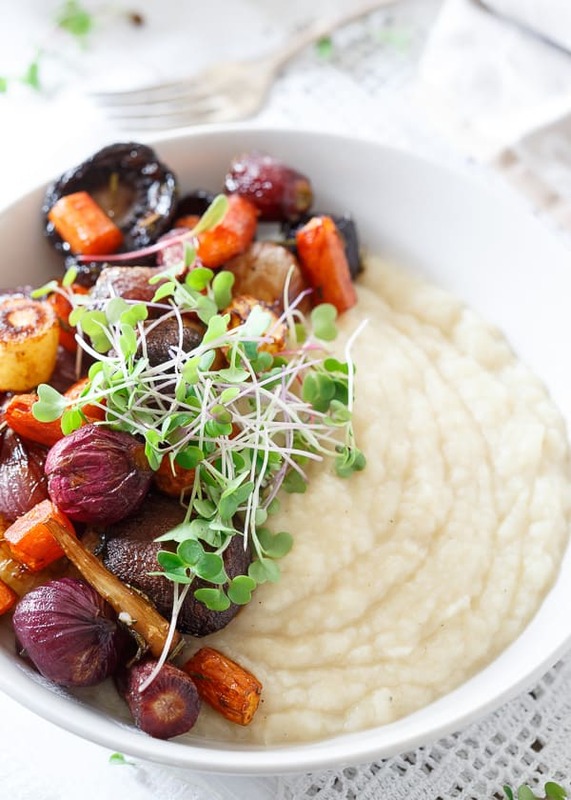 Love this recipe for celery root puree with roasted balsamic vegetables? Creamy pumpkin garlic pasta with tuscan kale and Kale feta egg bake. 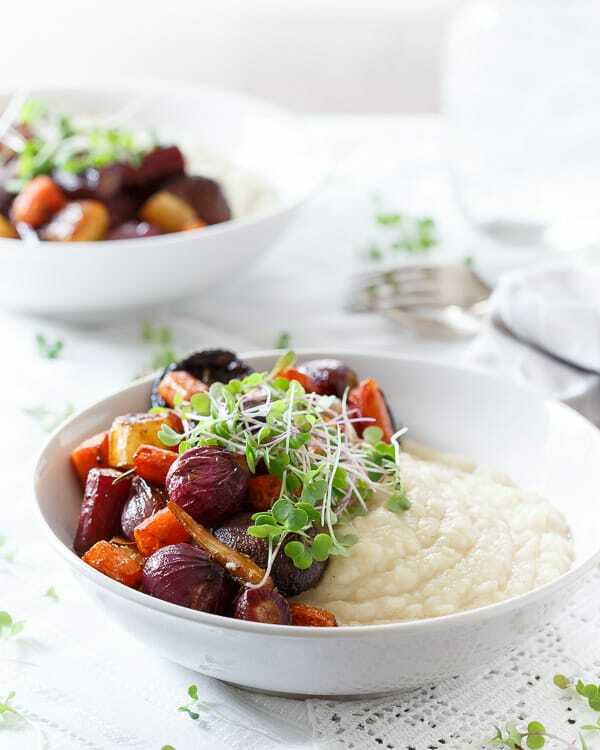 Sweet balsamic coated rainbow carrots, pearl onions and mushrooms are roasted until tender and served on top of a creamy celery root puree. Place the olive oil in a large pot over medium heat. Once hot, add the garlic and saute for about 1 minute until fragrant. Add the celery root, stir to coat in the olive oil and cook for 2 minutes. Add the almondmilk and vegetable broth, stir and bring to a boil. Once boiling, lower heat to a simmer, cover and cook until fork tender, about 20-25 minutes. Transfer celery root to a food processor, reserving cooking liquid. With the food processor running, slowly pour in cooking liquid until smooth and creamy, scraping down sides as needed. Season with salt and pepper to taste and set aside. Place carrots, onions and mushrooms on a baking sheet, toss with olive oil, salt and pepper and roast for about 15 minutes. Whisk the balsamic vinegar, herbs and honey together in a small bowl. Remove baking sheet from the oven, pour the balsamic mixture over the vegetables and toss until fully combined. Return vegetables to the oven for another 5-7 minutes. 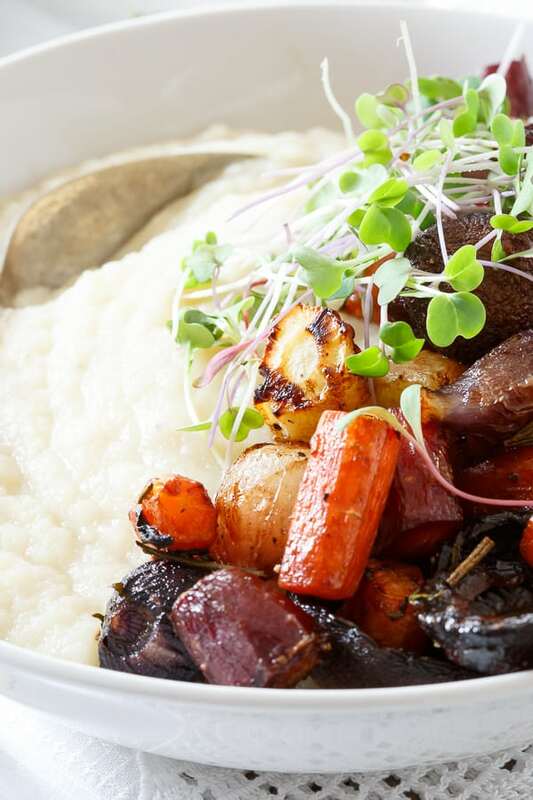 To serve, spoon celery root puree into bowls, top with roasted vegetables and micro greens for garnish. I’m totally with you. I have big Netflix plans for this weekend and I can’t wait for the weather to stop teasing and finally just get nice. This recipe is absolutely stunning!! I can’t stop gazing at these images Gina! So beautiful. Pinning! You really did capture the essence of March and the juxtaposition of the cold temps and spring freshness to come. PS, Did you get your new computer? Are you in love with it yet? This is so gorgeous!! Makes me want to get in my car and go get some SILK!! Gorgeous photos! I need to try celery root puree, this looks so good especially with those balsamic veggies! This looks amazing! I have been wanting to roast vegetables with a balsamic for quite some time. Do you have a balsamic vinegar that you can recommend? I have been hunting for awhile for one to use on roasted veggies. Where do you find celery root? It’s not just the bottom of the stocks, right? No, celery root is a root vegetable, completely different than celery. It’s at most grocery stores near turnips and such. No mention of whether the puree needs to be served hot/warm or completely cooled. If you have left-overs, would it be your preference To serve the celery puree cold, or reheated? I have picky grandkids—so we’re likely to have left-overs. I just would like to know if you have any suggestions/recommendations as to the best way to enjoy said left-over puree so my daughter and son-in-law will have a better idea of their options . Thanks. I think it’s best served warm but up to you!